If you are looking for a lively holiday in Ibiza, take a look at the 2 star Mare Nostrum Hotel in Playa D'en Bossa. Everything at the Mare Nostrum is geared to having fun. Firstly, there is the pool area with plenty of space to sunbathe and two pools to cool down in. The adjoining pool bar is handy to keep you topped up with drinks and snacks. Secondly, for activity fans, there is a tennis court, ping pong, billiards and a gymnasium. On top of this, there is a top class choice of eateries onsite. The restaurant is a serve yourself affair with lots of tasty dishes on the menu. It is fun all the way for the children too with a mini club, kids pool and playground. The long sandy Playa D'En Bossa beach is just a 150m walk, perfect for sandcastles and sunbathing. After a busy day, chill out on your room terrace and watch the sunset over the sea. Finally, we come to the nighttimes. There is hotel entertainment three times weekly at the Mare Nostrum. For party seekers, Space nightclub and Bora Bora beach bar are virtually on your doorstep. Fun and games, sunshine and sunbathing, it is easy to see why the 2 star Mare Nostrum Hotel is a popular place to stay in Ibiza. The Mare Nostrum Hotel has all the facilities you would expect from a 2 star hotel in Ibiza. Highlights include: two swimming pools surrounded by a landscaped terrace, gardens, buffet style restaurant, poolside snack bar, internet and WiFi access (charge), lounge and supermarket. The 24 hour reception offers excursions, luggage room, safety deposit boxes, car and motorcycle rental. On the sports front, there are ping pong tables, billiards, football table, tennis court and gymnasium. The children have a mini club, nursery, playground and pool. 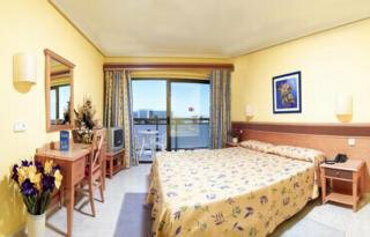 The Mare Nostrum has 516 guestrooms, comprising single and double rooms. All rooms are comfortably equipped with air conditioning, satellite TV, safety deposit box, bathroom, WiFi connection and telephone. The majority of the rooms also have a private terrace. Cot available on request. There is lots of choice when it comes to food and drink at the Mare Nostrum. Meals in the restaurant are buffet style with international flavours and local dishes. Snacks, drinks and ice creams are served in the poolside snack bar during the daytime. Evening entertainment includes three times weekly shows. The Mare Nostrum Hotel is located 150m from the beach in Playa D'en Bossa. The airport is 5kms away and Ibiza Town is 2kms from the hotel.